In early 1995, a movie dubbed Jumanji was released and by the end of the year, it was already being ranked as one of the best magic inspired movie to have ever been produced. To this day, Jumanji still ranks as an all-time great magic inspired movie. Perhaps, one will not be far from the truth if s/he attributes Jumanji as the pioneer of Sci-Fi movies that are now dominating the movie industry. The success of the movie inspired renowned software developer, Net Entertainment to come up with a Jumanji inspired game. As Net Entertainment lovers have come to expect, the developer duly delivered a game that has since enjoyed massive success and popularity across the online gaming industry. Players looking to enjoy this beautiful game can do so at several casinos online by simply spinning the game’s five reels that come with thirty-six paylines. The background of this slot game shows an aerial picture of what looks like the inside of a castle. A glowing chandelier lights up the reels on the bottom left side, a few baboons guard the reels on the bottom right corner and in the top right and top left corners there are some cupboards that we assume, are meant for storing the game’s treasures! The reels of this slot are all covered by a solid brown colour, and they are designed in a 3, 4, 5, 4 and 3 structure. The background graphics in Jumanji slot game depict the opening monologue in the movie. Jumanji game is a game that you can play either for free or you can play Jumanji for real money. If you opt to play for real money, then you have to bear the following in mind. Jumanji’s paylines are fixed. What this means is that when playing the game for real money, you have to wager across all the 36 paylines. While others may prefer adjustable paylines, the beauty of this slot game’s paylines is that they offer you more ways to win as they can reward you for combination originating either from the left to the right or from the right to the left. You also need to bear in mind that the minimum bet per line in Jumanji casino slot online is set at 1.00 coins meaning you need 36.00 coins to wager across all the 36 paylines if wagering with the minimum bet per line. The maximum bet per line is set at 10.00 coins, and you need 360.00 coins to wager across all 36 paylines using the max bet per line. Wagering with the maximum coin size means that you increase your potential winnings. The slot does come with an ‘Autoplay’ button that you can use to spin the reels automatically. 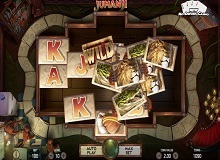 The Wild symbol in Jumanji slot is represented by an icon written ‘WILD’. The Scatter symbol in the slot is represented by a treasure box. The Wild Stampede feature is the first of four random bonus features. This reward will see some rhinos stampeding the reels. When all of them pass, at least four up to nine of the symbols on the reels will become wild. The Monkey Mayhem feature is the second random bonus feature. In this bonus, symbols will automatically spin themselves and in the process guarantee you a winning combo. The Monsoon Wilds feature is the third random bonus feature. In this bonus, at least one of the reels will transform into a wild reel for a couple of spins. The fourth random bonus is the Sticky Vines feature. In this bonus, you are rewarded with a random number of re-spins. The Board Game bonus is triggered when you land at least three of the scatter symbols. This bonus will lead you to another set of bonus features depending on where the dice you roll ends up. 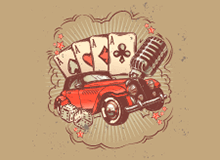 The Stampede free spins feature is triggered when the dice rolls on to the box corresponding with this bonus, you get five free spins and also the Wild Stampede feature applies throughout the bonus. The Monkey free spins feature is unlocked when the dice rolls on to the box corresponding with this bonus. You get six free spins, and the Monkey Mayhem feature applies. The Monsoon free spins feature is activated upon the dice landing on the corresponding box of this bonus. You get seven free spins, and the Monsoon Wilds feature applies. The Vines free spins activate when the dice rolls on to the box corresponding with this bonus. You get 10 free spins and also re-spins. 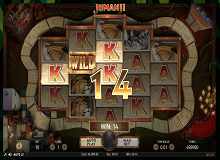 The pays the most in Jumanji slot rewarding you with up to 140 credits for five. The hippo rewards you with up to 50 credits for five of these. The crocodile rewards you with up to 30 credits for five of these. The peacock rewards you with up to 25 credits for five of these. Card symbols reward you with up to 10 credits for five of a kind. 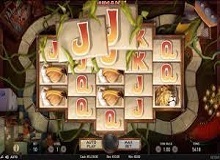 Jumanji is a slot game with a difference especially when it comes to its many bonuses. Players can enjoy Jumanji free or for real money on their mobile devices or on the desktop. This is a medium volatility slot game with a 96.33 RTP.